Isn't it interesting that the stories both above and below demonstrated how different it could be when women are in charge instead of men? The most infuriating thing about the Ark plot so far has been that Jaha and Kane kept ignoring what was happening on Earth when it was of absolutely critical importance. Thankfully, that has finally changed because Raven and Abby insisted on finding a way for the ground to communicate with the Ark. Learning that the 100, or most of them, were still alive and those 320 people above possibly didn't have to die was a wake-up call for Jaha, who decided to call a general assembly and tell everyone everything. That surprised me a little, since I expected the suppression of the truth to go on quite a bit longer. Instead, Jaha is activating Project Exodus, and finally, the light dawns. There are 2,237 people on the Ark, and room for only 700 people on the existing drop ships. So the atmo problem won't be going away, then. I suppose a really big dangly hose isn't going to work. Jaha learned that his son Wells really was dead. He'd obviously been holding on to some hope because he was devastated. But Jaha's grief didn't seem earned to me when compared to Ridley, the guy who was screaming at the Council members because his wife had been one of the "culled," a.k.a., murdered. And Marcus Kane did a complete one-eighty and was suddenly wracked with guilt. That seemed a bit abrupt to me, considering how bloodthirsty he appeared before, and how he has kept expressing a deep desire to execute Abby. Also interesting that up until now, he was mostly referred to as 'Kane' and in this episode, he was called 'Marcus.' Just as if the writers realized that they'd screwed up with him and wanted us to see the character differently. I haven't seen the rest of the series yet and it will be interesting to see if Abby's replacement on the Council by former Chancellor Diana Sydney (Kate Vernon from Battlestar Galactica), champion of the workers, will make a difference. 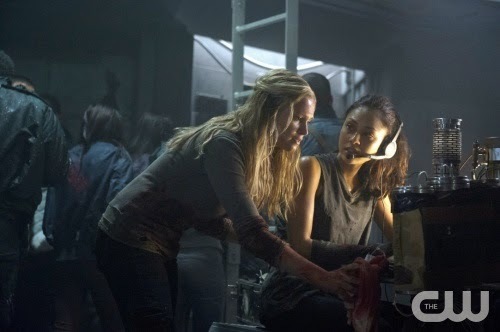 Clarke stepped up, working with her mother on the radio to save Finn's life. Clarke also showed maturity when she decided to unselfishly "give" Finn back to Raven. But then she dithered about what to do when Bellamy decided to torture Tatt Guy. It was clear that Clarke was on the fence about whether or not torture was warranted. I immediately thought the best way to find out which vial was the antidote was to use the knife that injured Finn on Tatt Guy, and I assumed that this would occur to Clarke. Instead it was Octavia's turn to step up, and she went it one better by cutting herself. She knew that Tatt Guy cared about her. (Although it had also occurred to me that Tatt Guy was just looking for an attractive mate, and there Octavia was.) If Tatt Guy could be a possible ally, Bellamy torturing him may have been, you know, the wrong move. With Clarke and Octavia saving Finn's life and Raven getting the radio working, the three young women saved the day, and Bellamy almost certainly made things worse. Like I said, maybe the women should be running things – both above and below. Tatt Guy had a handmade book, glass vials, poison and an antidote. Who made those things? The level of technology on the ground is confusing. Tatt Guy's book showed 102 marks, with ten crossed out. Honestly, I've studied this stuff. People who don't have an advanced understanding of numbers tend to see them as one, two, and many. Tatt Guy's drawings were too sophisticated, too. (Was one of them a yeti?) Plus he speaks English. I hope all of this stuff ends up making sense. — Clarke is still mad at Abby for supposedly turning in her father, which certainly doesn't feel like something Abby would do. Abby was trying to explain to Clarke that it might have been Jaha's fault but Clarke wasn't ready to listen. — The weather map in the Ark showed a tornado moving toward what looked like the southeastern United States. Can I conclude that this is where the 100 landed and that the mountains are the Appalachians? — Could I mention how much I despise Bellamy calling Clarke 'Princess'? It's such a put down, and also untrue. Clarke: "This is not who we are." Abby: "I think he might just be out of the woods." Clarke: "Well, down here, there's nothing but woods." Jaha: "We are on the Titanic and there aren't enough lifeboats." Interestingly, the numbers are almost identical. There were 2,223 passengers on the Titanic, and only 705 survived. The Mount Weather Emergency Operations Center is an actual place and located in the Blue Ridge Mountains of Virginia so I presume that's where they are. Reviews full of snark are sometimes my favorite reviews, Billie! Fun review Billie and I'm with Laure Mack snark is sometimes good but it is also a great way to assess your appreciation of a show - a snarkometer? The Grounder culture is facinating, really, and things do make more sense later on, but it's hard to believe they'd have such a different society only 97 years after the nuclear devastation. I tend to ignore that because grounders rule. I don’t trust Kate Vernon. I don’t know if that’s because of past character associations, or because of the little smile she exchanged with the guy mourning his wife after she wormed her way onto the council. Maybe both. Either way, I don’t trust her, and I’m now starting to wonder if she was the one working with Terry Chen to assassinate Jaha. Kane has certainly seemed the most suspicious on that front, thus far, but since they are now trying to turn things around with him, my suspicions are turning elsewhere. I really liked Bellamy’s line near the end about who they are not being who they need to be to survive in this ‘verse. Shades of The Walking Dead, only with a much stronger female focus and WAY more interesting female characters from the jump. I’m with Mark from last episode’s review: this Finn guy is totally not worthy of the attentions of these two awesome ladies. Clarke setting him aside was a strong character move for her, but I hope Raven soon finds the strength to set him aside, too. She deserves better than being the “she needs you more” chick. Erg. Kick this guy to the curb and get that “great potential friendship” going, ladies.